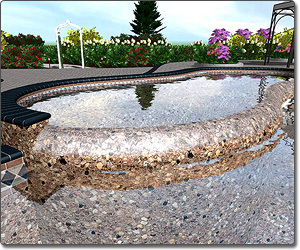 Impress your clients with detailed 2D and 3D swimming pool designs using Realtime Landscaping Architect 2014. Create virtually any conceivable swimming pool design with ease, and stand out among your competition with faster and more detailed designs. 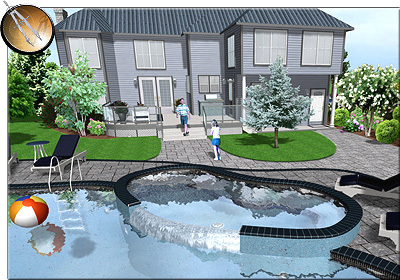 Design both above ground pools and below ground pools using Realtime Landscaping Architect. 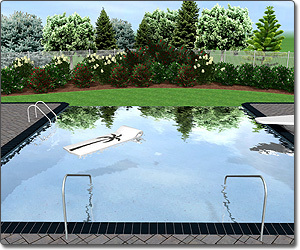 Both types of pools are simple to design, yet offer an incredible amount of versatility. Below ground swimming pools can be built in virtually any size and shape imaginable, from simple kidney-shaped designs to fully customized creations. 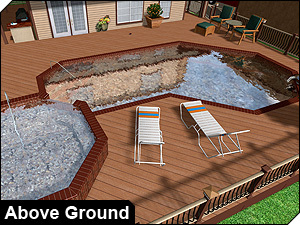 Above ground swimming pools are created in the same freeform fashion as below ground pools, and are simply elevated with a few clicks of the mouse. 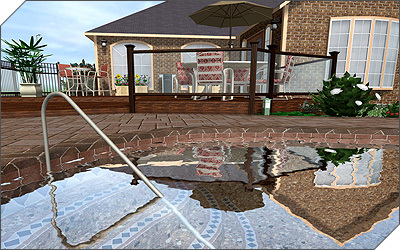 Create an unlimited variety of spas using the intuitive spa design tools included with Realtime Landscaping Architect. Design spas that flow into a swimming pool, are elevated or recessed into the pool decking, and even spas with infinity edges. 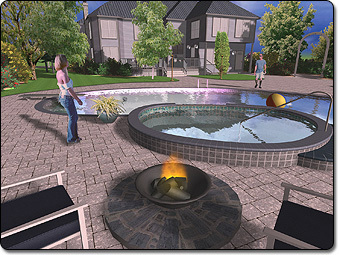 Add pre-built hot tubs to your swimming pool design with only a few clicks of the mouse. 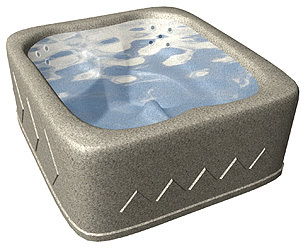 Choose from dozens of different hot tub styles, and customize the materials to accommodate your design ideas. 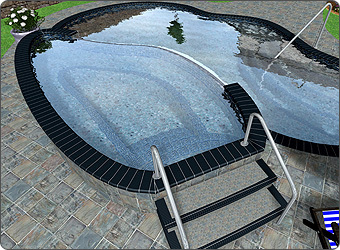 Customize your swimming pool design in 2D to provide professional swimming pool plans. 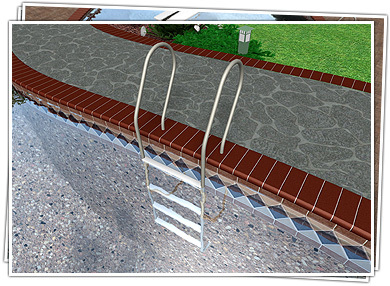 Choose between stylized options like watercolor or colored pencil, a traditional CAD style, or a realistic top-down view of the swimming pool design. 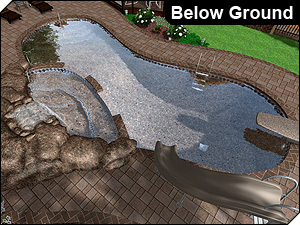 Print your pool plan, e-mail it to a client or contractor, or even upload your plan to a website. Switch between the 2D Plan View and the 3D Perspective View with one click of the mouse. 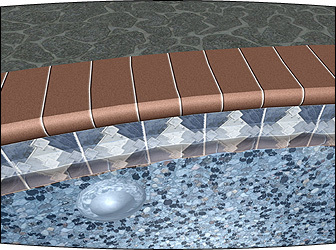 Create swimming pool designs using a wide variety of coping options. Choose from adjustable tile coping, flagstone, or rockery. 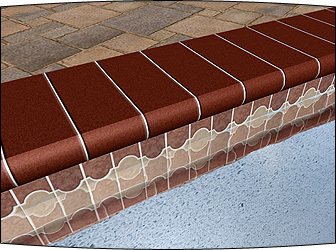 Coping profiles can be bullnose, flat, or even a seamless extension of the swimming pool decking. 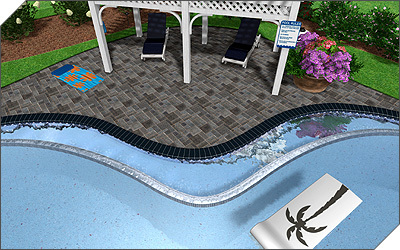 Choose high quality swimming pool tile from a library of over 700 options, including pool tile from MasterTile and Noble Tile Supply. 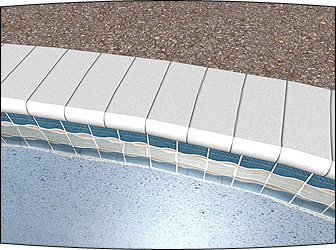 Have a custom style of pool tile? 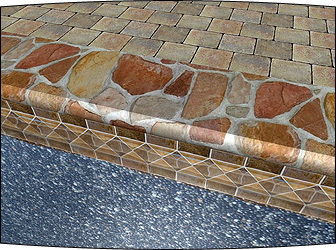 Simply import a photo of your tile and apply it to your swimming pool design. 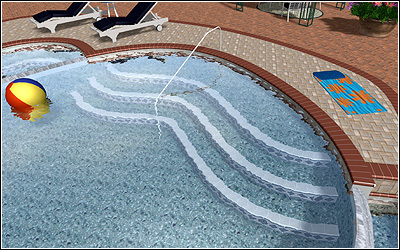 Infinity edges add a stunning effect to your swimming pool designs. Use infinity edges to create an optical illusion, to join a spa with a swimming pool, or simply to create a tranquil water flow. Multiple types of infinity edge profiles are available, allowing you to achieve the perfect swimming pool design. When viewing your design in the Realtime Walkthrough, water will realistically flow over each infinity edge. 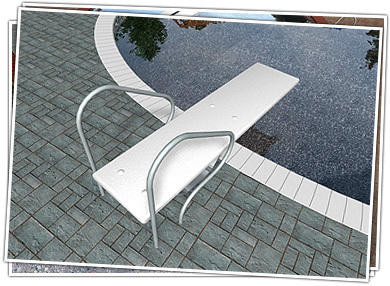 Customize both nosing and tile for each seat or set of pool stairs, adding an unprecedented level of detail to your 3D swimming pool design. Choose from hundreds of nosing and tile options. Customize your swimming pool design with more than 300 high quality pool accessories, including dozens of products from S.R. Smith. Use accessories to bring your designs to life, making them stand out among the competition. 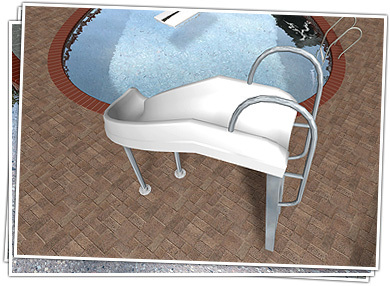 Import custom swimming pool accessories from the Google 3D Warehouse, expanding the available accessory options even further. Visualize your swimming pool design at night, illuminated by adjustable pool lights. Add a pool light with just a few clicks of the mouse and then customize the light as needed. Swimming pool lights can be placed on the walls or the floor of the swimming pool design. 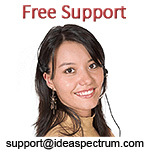 The brightness, color, size, and materials of the lights can be adjusted freely. Design houses, decks, fencing, yards, gardens, roads, and much more with easy-to-use tools. Design the area around the swimming pool to increase the professionalism of your swimming pool plan by putting the pool into context. Win more bids by showing your clients their complete landscape with your swimming pool design as the focal point. 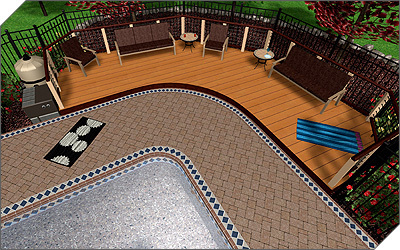 This software is a complete set of tools for designing swimming pools, spas, lawns, buildings, decks, patios, edging, retaining walls and other landscaping features. All products are shipped the next business day.